The greatest challenge that surely faced Christopher Nolan in his development of the third Batman film was finding an antagonist that could effectively follow the late Heath Ledger’s incendiary turn as The Joker in The Dark Knight, as well as fitting in with Nolan’s realism-infused take on the Batman mythology. it’s easy to see why Strange would have appeared on Nolan’s radar: he’s a more-realistic character anchored on psychology – and, crucially, so far unused in the cinematic Batman’s. While not the most prominent member of Batman’s Rogues Gallery, Strange has the distinction of being Batman’s earliest recurring villain, first appearing in Detective Comics #36in 1940, preceding the more flamboyant likes of The Joker and Catwoman by a few months. A brilliant scientist, Strange crossed moral and ethical boundaries as a result of his fervent desire to conduct human experiments, embracing crime to fund them, which inevitably brought him in to conflict with Gotham’s Dark Knight. However, it’s the later renditions of Strange that would make him a particularly attractive proposition. 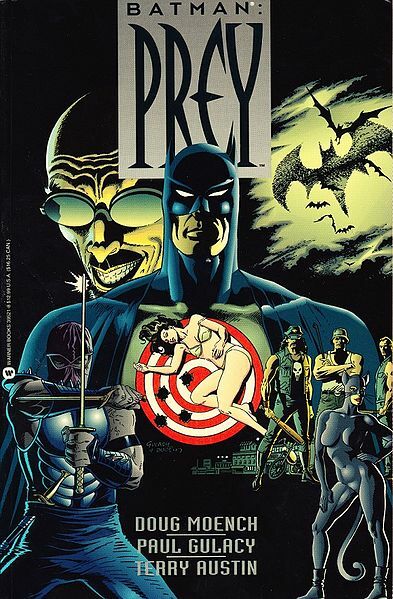 Published in 1990/91, “Prey” was an early and highly-regarded story arc in the “Legends of The Dark Knight” comics series. 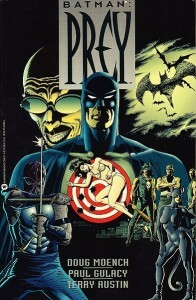 Written by Doug Monech and with art by Paul Gulacy, “Prey” saw Strange as a media-savvy TV psychologist with a deep fascination with Batman. Strange’s pointed suggestions of the innate danger that the costumed vigilante presents whips up Gotham’s anti-Batman sentiment and forces Captain Gordon to lead a city-wide manhunt for The Dark Knight. 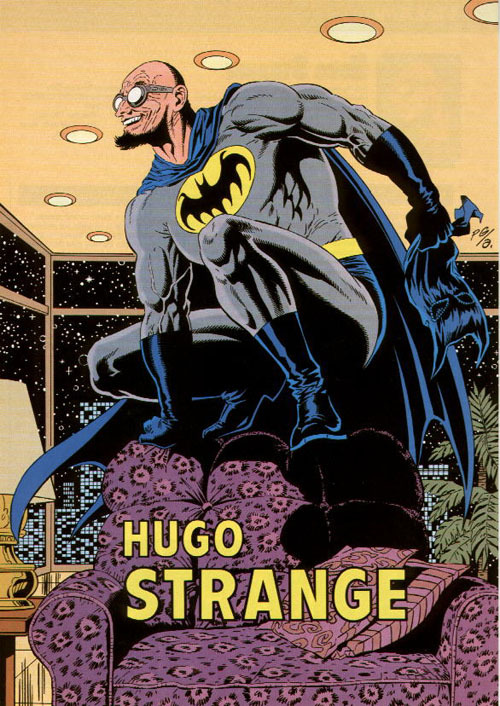 In the midst of this, Strange’s develops a monomaniacal obsession with Batman, to the point where he wants to become Batman – possessing a similarly massive physique to don the costume – and concluding along the way that Batman can only be one person: Bruce Wayne. More recently, Matt Wagner’s “Batman and The Monster Men” (2005/6) – a modern retelling of the Hugo Strange story from Batman #1 – depicts Batman’s first encounter with Strange, also reintroducing Julie Madison, an early love interest for Bruce Wayne. Given that Nolan liberally referenced Frank Miller’s Batman:Year One (1988), Alan Moore’s The Killing Joke (1989), Sam Hamm’s Blind Justice (1989) , Denny O’Neill’s The Man Who Falls (1989) and Jeph Loeb’s The Long Halloween (1996/97) in both Batman Begins and The Dark Knight, it would not be surprising if he once again sought inspiration from Batman’s source medium. Indeed, Prey’s plot strand of massive public distrust in Batman and his being hunted by Police does tie in perfectly with the climax of The Dark Knight, which saw the triggering of the same thing. Pertinently, Monech’s tale also has the double-female presence of Catwoman and the daughter of Gotham’s Mayor whom Strange desires, which ties in with The Dark Knight Rises’casting call for two actresses, one a villain, the other a love interest. All of which is just conjecture, of course but, if the nefarious, demented Doctor does make his cinematic debut in The Dark Knight Rises – and it’s looking increasingly plausible – then Hardy is a tremendous choice. His utterly compelling turn in the 2009 film Bronson, where he bulked up considerably and went bald to play the unhinged, real-life psychopath Charles Bronson – “the most violent prisoner in Britain” – saw him display a chilling mixture of charm and malevolence with great aplomb. Imagine that, but with Hardy in a Batman suit, engaging in extreme psychological warfare and physical combat with The Dark Knight. Let’s hope so, because I’m absolutely sold on that – it would make for a magnificent finale. 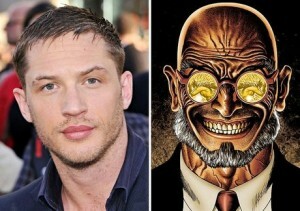 Besides: who else was Hardy going to be? Firefly…?? Agree that Hardy could be awesome in the role, but I don’t see Strange being the principal villain He’s more like Jonathan Crane was in the first movie. Wasn’t there a rumor Talia al Ghul was going to be the bad guy this time out?